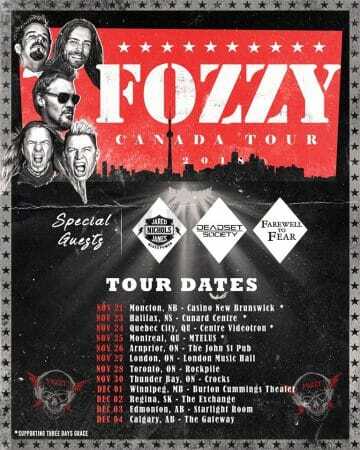 Fozzy featuring WWE superstar and singer Chris Jericho are in the midst of their Canada Tour 2018 along with special guests Jared Nichols James, Deadset Society and Farewell To Fear. Fozzy played at The Rockpile in Toronto, Ontario, Canada yesterday and Sleaze Roxx has received reports that it looked like Jericho was miming on stage (i.e. lip synching). One concert goer reported to Sleaze Roxx that they were disappointed to see that Jericho was miming on stage to the point that it ruined the concert for them. Video footage of Fozzy performing live at The Rockpile was recently posted on Facebook (see below) and none other than former Skid Row frontman Sebastian Bach (under the alias Sebastian Bierk) apparently posted the following comments at 0:00 and 0:52 of the video, “Wow he mimes to a tape very well” (see below). Wikipedia describes lip synching as follows: “Lip sync (short for lip synchronization) is a technical term for matching a speaking or singing person’s lip movements with prerecorded sung or spoken vocals that listeners hear, either through the sound reinforcement system in a live performance or via television, computer, cinema speakers, or generally anything with audio output in other cases. The term can refer to any of a number of different techniques and processes, in the context of live performances and audiovisual recordings.